For the first time ever, the ball gown is being replaced by a Little Black Dress in both the Miss England Midlands semi final events held at Resorts World Birmingham on June 2nd and the Leicester Tigers on May 31st . The reigning Miss England Alisha Cowie (19) and Miss West Midlands Niamh Conway (24) modelled this cute little black dress price £51 from “Religion Clothing” this weekend in a fashion shoot at Resorts World ahead of the contests to promote the event. 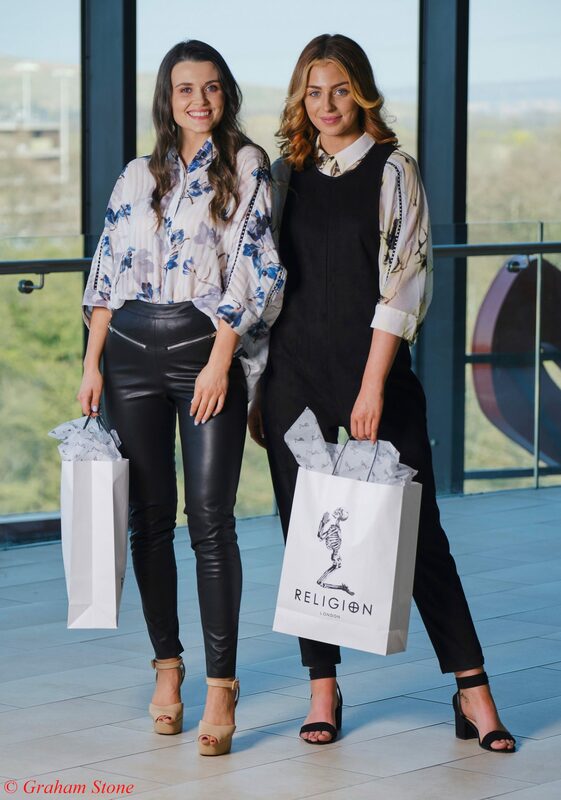 Alisha and Niamh (pictured above ) wearing clothing from Religion at Resorts World Birmingham . “Contestants usually need a ballgown for both the semi & the final of Miss England. In the Midlands semi final, contestants WONT need a ballgown to compete, only the ladies who reach the final will. I’m hoping other regional contests will eventually follow suit but maybe next year. It’s a fact girls don’t like to wear the same dress twice. Many end up spending hundreds if not thousands of pounds on at least two ballgowns in one year and it gets very expensive! “ says Director Angie Beasley. Alisha Cowie from Newcastle, the reigning Miss England said. “In 2018 when I competed I spent £800 on 2 different ball gowns which I haven’t worn since! I love the simplicity of a Little Black Dress and you can really see who the girl really is” For winning Miss England , Alisha won a wardrobe of evening wear from Bella Donna Boutique . Since becoming Miss England, Alisha cut 11ins off her hair for the Papyrus Charity, the prevention of young suicide who she is now an ambassador for. Alisha also represented England at the last Miss World final and is now looking for her successor who she will crown in July. The winner will go forward to Miss World in Thailand & win a wardrobe of ball gowns to compete. Other changes in 2019 include the Miss England branded regional heat crown worn by contestants which has been axed and now just the Miss England winner gets to wear the official Miss England branded crown. There’s also a new Ethical Fashion theme in Miss England 2019 which is #wearitgreen . Contestants will need an up cycled green outfit for both the Midlands semi and national final. Other Miss England heats will be held in London, Liverpool, Newcastle Lincoln Manchester and Dorset with a recent Grimsby Cumbria event being held. To enter Miss England 2019 go to www.missengland.info and enter online . Resorts World is a destination like no other. Home to a fantastic range of places to eat and drink, both family favourites like Zizzi, Miller & Carter & TGI Fridays and special new places to discover like Sky By The Water, plus a little outlet shopping from brands like Nike, Levi’s, Next and Kurt Geiger. Add in awesome family entertainment at Cineworld, virtual reality at Vortex, plus the luxury Genting Hotel and Santai Spa. You’ll find a little bit of everything you love and more, all under one roof, at Resorts World.